Join us at an Event! Join with your tax deductible gift $30 or more and get a free turtle sign for your yard. 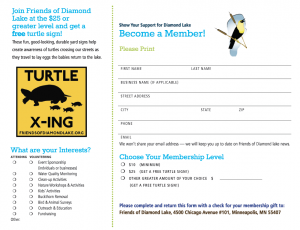 Your membership helps Friends of Diamond Lake continue working to protect, restore, and improve Diamond Lake and its watershed.